Regional Science Fair: 10 participants/6 projects entered earning 2 gold, 4 bronze and 1 advancement to State Science Exposition. Band for Today: 13 SJS students participated in the solo contest earning silver and bronze medals and trophies for exceptional performances; 4 SJS students participated in the annual Honor Band Festival. Basketball: Boys 5A won championship; Boys 7A and 8B1 and Girls 5A took second place in championship games. Illinois State Science Exposition: 13 SJS students/7 projects entered into State Science Exposition and received 1 Bronze, 4 Silver and 2 Gold awards and a special award from the US Navy – Office of Naval Research. Band for Today: 8 SJS students were invited to participate in Honor Band Performance out of 90 students from 30 schools. Montini Academic Bowl: Several SJS 7th graders competed and placed 1st, 2nd and 3rd among 20 teams. Illinois Junior Academy of Science Regional Exposition: St. Joseph students earned Gold and Silver medals in several science fields. Seven projects will move on to the State Science Exposition. Nazareth Math Competition: Our 7th grade math team competed against 12 schools and earned 3rd place. Nazareth Scholastic Bowl: Two SJS teams competed – 1 team in 3 rounds finishing in top 10 of 18 teams; 1 team in 5 rounds and won the competition. Downers Grove Junior Women’s Club Art Contest: 7th grader Joey Schamber’s painting Winter Solace was judged “Best in Show” among 40 entries. Class of 2017 Achievements: 82% of our graduates made their first semester Honor Roll; 50% achieved highest ranking by being placed on their 4.0 & Above Honor Roll. Nazareth Scholastic Bowl: Two SJS teams competed in 3 rounds and finished in top 6 of 21 teams. Benet Academy Academic Bowl Competition: 7th grade team earned 1st place in History and 3rd place overall; 8th grade team earned 1st in English and 2nd Overall. 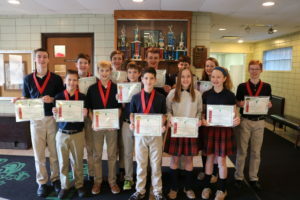 Nazareth Academy 8th Grade Math Contest: SJS earned 3rd place overall; One student earned 2nd place. 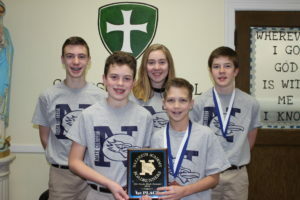 Nazareth Academy 7th Grade Math Contest: SJS earned 2nd place overall; Two students placed in 2nd and 3rd. Boys Football: JV – 5th/6th Grade Finished 2nd place in our division. Varsity – 7th/8th Grade finished the season 4-4. Girls Volleyball: Both the 7th & 8th Grade teams won this year’s Bronco Bash Tournament hosted by Montini High School. 7th & 8th Grade A girls also won the DPL championship tournament. Cross Country: 6th Grade girls and boys teams and 9 individuals repeatedly received ribbons; St. Joseph School co-hosted a cross country meet for 26 area Catholic schools; St. Joseph 2015 Alumni led the Downers Grove South girls cross country team to a 4th place at the state meet this fall.